Less than a year after the stunning victory of the new government in the Malaysian election, new Prime Minister, Mahathir Mohamad faces serious challenges stemming from the gap between the views of the multiethnic and religious reformist coalition of his allies and the majority of Malay Muslims. The most recent test involved tensions between Malays and Hindus. According to Malaysian media reports, the managers of Seafield Sri Maha Mariamman Temple in Petaling Jaya, close to Kuala Lumpur, had reached a deal with a construction company in 2014, under which they would receive 1.5 million ringgits ($357,000) to transfer the temple to another location 3 kilometers away. However, after the decision, they faced opposition from temple-goers. On November 26, the temple was attacked by masked men, alleged to be Malays, demanding that the land be vacated immediately. The resulting chaos lasted for a few days and led to dozens of arrests and a serious reaction from the Malaysian authorities. Yet Mahathir attempted to deny the religious and ethnic origins of the conflict and claim the riots were solely the result of a land dispute. The Sri Maha Mariamman Temple incident happened at the same time that the government faced backlash from Islamic NGOs as well as opposition parties over a plan for Malaysia to join the International Convention on the Elimination of All Forms of Racial Discrimination (ICERD). The Malaysian government has so far agreed to only three of the United Nations’ human rights conventions, the Elimination of all Forms of Discrimination against Women, the Rights of Children, and the Convention on the Rights of the Disabled. Malaysia has yet to sign on to six other conventions, including not only ICERD but also the International Convention on Civil and Political Rights, the International Convention on Economic, Social, and Cultural Rights; and the Convention against Torture and Other Cruel, Inhuman or Degrading Treatments or Punishments. At the last UN Human Rights Council meeting in Geneva, a Malaysian government representative said that his country plans to approve six remaining human rights conventions. Despite electoral promises to approve these agreements, in particular ICERD, when faced with a rapid and serious backlash from the Malay Islamic parties, groups, and NGOs, the new government led by Mahathir backed down. But on December 8 and 9, despite the government announcement that it was no longer joining this convention, both opponents and advocates held massive demonstrations in the main squares of Kuala Lumpur and Putrajaya. It is noteworthy that Malaysia is one of just 14 countries — along with North Korea, Myanmar, and South Sudan — that have not yet approved ICERD. Other Muslim countries like Saudi Arabia, Egypt, Turkey, and Iran have already signed. These two recent incidents together indicate the problems Mahathir faces in his new era as prime minister with regard to racial disputes, reforms, and keeping the confidence of the majority of Malay Muslims. Some Malaysian analysts suggest that the Pakatan Harapan (PH, meaning Alliance of Hope) led by Mahathir does not believe in the priority of the Malay people, who make up 60 percent of the population (ethnic Chinese are 23 percent and ethnic Indians 7 percent of the Malaysian population). Most of the government’s opposition, which includes the majority of Muslim Malays, believe that the new government does not have special concern for this majority. Following the 1969 tensions and the bloody Chinese uprisings, Mahathir, as the head of the United Malays National Organization (UMNO) Party and the long-term ruling coalition of Barisan Nasional for many years, took special interest in the Malay people. But after leaving and UMNO, Mahathir formed the Malay Indigenous Party along with a group of former government officials and created the PH coalition, which would eventually defeat UMNO and its coalition in the May 2018 election. PH won the support of the Chinese and Hindi ethnic parties as well as Malay opposition parties. According to polls, PH had 30 percent support from Malays, while UMNO and former Prime Minister Najib Razak enjoyed just 40 percent support from Malays; therefore, Mahathir’s victory was due to his ability to win over support from both the majority group and religious and ethnic minorities. But the tensions inherent in that alliance are now surfacing. Although many Malays had no problem with the defeat of Najib and UMNO, after their corruption was exposed, some of the decisions of the new government ran up against Malay sensitivities. For example, the appointments of the first non-Malay attorney general and the first non-Malay finance minister encountered a swift backlash. A polls conducted by the Murdoch Center in Malaysia revealed that ethnic and religious concerns have increased since the recent election, with 21 percent marking this issue as a worry in August compared with just 12 percent in April. Malaysian analysts believe that the new government will be under pressure by political opponents such as UMNO and the Islamic parties like Malaysian Islamic Party (PAS) in different areas, including the ethnic, racial, and religious issues. If PH can resolve sensitive ethnic-racial, and religious issues properly, it will surely overcome any other crises and problems that the opposition will create; alternatively, if PH stumbles in this regard the opposition parties will challenge the alliance. 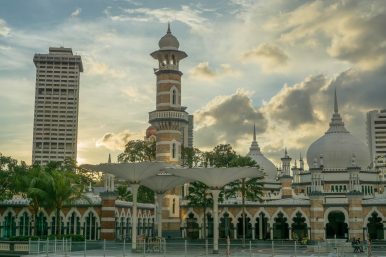 Malaysian Minister of Religious Affairs Mujahed Yousuf Rawa acknowledged that the new reformist government is still trying to persuade Muslim Malays that its policies are in favor of the Muslim community and preserving Islamic values. He argued that the new government succeeded in achieving its goals in the election by winning over the Malays, but if it cannot continue this effort, it will lose the support of Malay voters. Mahathir, who was previously the prime minister from 1981 to 2003 and is now the oldest elected leader in the world, is still an intelligent political activist, and many expect him to continue his government efforts to support the Malay people. Mahathir highlighted his political savvy in the two recent incidents by abandoning membership in ICERD, and actively managing the religious unrest surrounding the Hindu temple. Seeking to reconcile the opposing protesters, Mahathir rightly said that such incidents could lead to major problems in racial harmony. Despite Mahathir’s deft performance in the two recent incidents, as well as his announcement that he will transfer of power after two years to Anwar Ibrahim, the powerful Malay leader of the Justice Party, some opponents claim that the new government is mandated by the current coalition of the Chinese and Indian parties. Critics suspect that PH is far less concerned with the interests of Malays than it promised in the elections. The new Malaysian government is taking a close look at multiethnic conditions in the country, and adopts a tolerant attitude toward the ethnic and religious backgrounds. That approach plays well with human rights demands from the international arena, but the reaction and opposition from the political rivals, citing religious and ethnic concerns, will only grow. However, the interaction-driven policy of the PH government and its consultation with think tanks and institutions can pave the way for future policies overcoming the challenges ahead. Dr. Abdulreza Alami is a researcher in the field of political sociology specializing in communication, media, and politics. He received his Ph.D. from the Department of Media and Communication Studies, Faculty of Arts and Social Sciences, the University of Malaya.